Recently I've taken an interest in card stock modeling. I've seen many pictures on the interweb, that shows some nice looking structures made of card stock or some kind of hybrid. 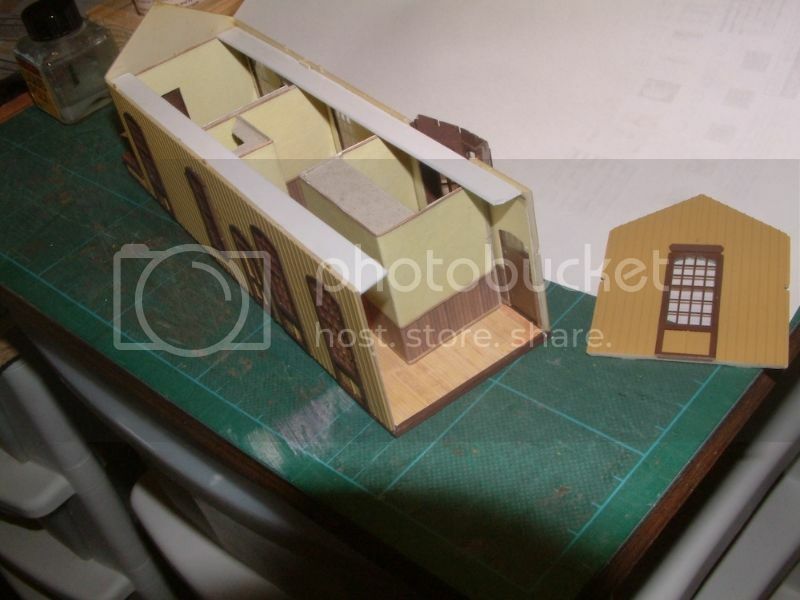 I've purchased/downloaded a couple of structures from the 'Clever Models' website, (they have a couple of freebies too) as well as a small building from the 'model train software' website. see: http://www.modeltrainsoftware.com . The last example is actually software that along with some examples, basically supplies you with a design package and lots of texture templates, to design and create you're own buildings. The Clever models site has a series of pre-designed structures ready for down load, as well as several textures (brick walls, windows etc) to make your own. See http://www.clevermodels.net/ . I'm curious if any of you use similar sites for structures, card stock textures, and perhaps have found a couple that are of good use for US modeling. I'd be particularly keen to find examples of structures that would be prototypical for California. I've also bought a couple of grades of paper to print these on, to experiment with what works best. So far I've got some sheets of 120gr/m2 , 160gr/m2 and 300 gr/m2 from an arts and craft supplier, to try things out with, any other suggestions on what works well? Here's my 'freebie' structure from the model-train-software site under construction. I have used Scalescenes http://www.scalescenes.com/, mainly for their texture sheets, but several of their buildings can be used for the US. I've also used Clever Models and downloaded free buildings of Alton, Illinois http://www.illinoishistory.gov/ps/const ... street.htm. It is not just for complete buildings, the new depot on the Western Union crossing module is a plastic kit, but the inside walls and floors are covered with Clever Models and Scalescenes sheets, stuck on card walls. If you have photos of a structure, follow Lance Mindhiem, who converted them into models. Another option of materials is foam core board to stick paper sheets to. 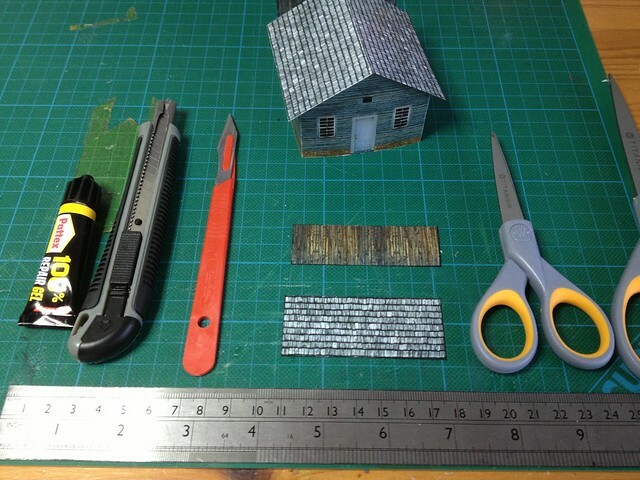 These buildings are Scalescenes wood textures on foam core. To get the colours I printed them on coloured thin card. You can use bits of kits for parts for others, for the depot interior doors I used one of one of the Alton building's doors. Even though the Alton kits are flat several copies can be printed and layered like Clever Models kits. I use water colour pencils to touch up the white edges of the card, where they show. Pictures off Google etc. can be used for interior decorations, I found some of timetable boards that I used in the depot along with paintings. Scalescenes make US roads with markings for junctions. Sheets can be printed out at any scale, so a N gauger can reduce them. More of a problem going up scale, a printer may split them across sheets or see if you can find an A3 printer (such as a colour copier). I enlarged the depot interior walls so they reached high enough. Thanks for the scalescenes suggestion Mike. I'd seen them in the past but forgot where it was. 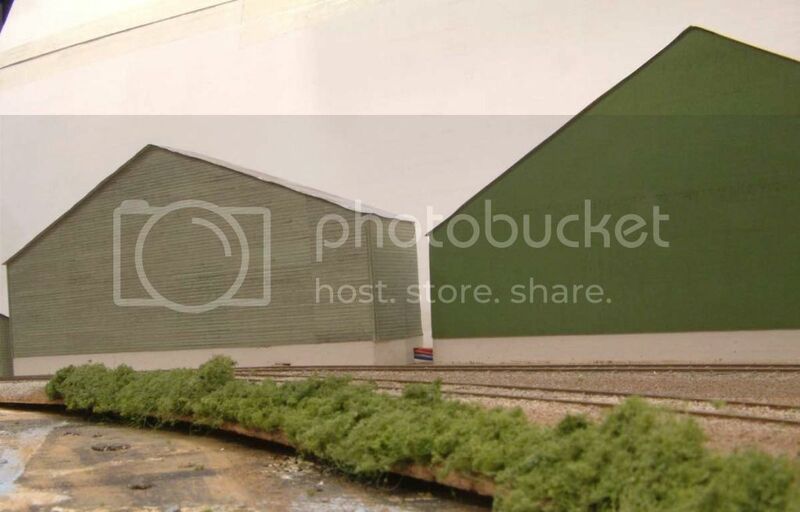 Are their OO scale buildings true OO (1:76) , or are they HO scale (1.87) , just so I know I need to reduce/enlarge by a certain percentage when printing. We have a colour laser printer in the office that I can print with, and we also have an inkjet A3 printer I could use, should I ever have to print something fairly large, but that does not happen often. I am familiar with Lance Mindheim's work, and like his photo structure approach too, but to get pictures of a building from all sides at good angles, is difficult if you can't travel to the area you want to model, and I don't have a very powerful photo editing suite to make corrections to angles etc if it isn't taken at a good 90 degree perspective etc. you've mentioned foam core board, which shop is a good source for that, as I do like the idea of that giving a structure a bit more strength , yet it remains light. I've bought foam core board from the Range, I'm sure arts and crafts stores will keep it. There is another type, Polyboard that the London Graphic Centre sells that can be used with solvent. Car spray paint does attack the basic stuff (found that out!) but for water based glues paints etc it is ok. Note if you glue paper to one side, it will warp a bit, I brace it with more foam board on the other side. So far I've only used 5mm thick board, it does come thinner and thicker.